So we've got a little win a bicycle competition running over at Copenhagen Cycle Chic. Cycle Chic teamed up with Velorbis and guests to our city during the Climate Conference can win a Velorbis 'Studine' bicycle. If you know anyone who is in town [they have to be in town to get the bike next week if they win], please spread the word. I'm looking forward to seeing what kind of entries people will send in. In Copenhagen? 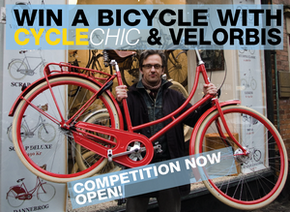 Win a Bicycle With Cycle Chic and Velorbis!